The scene: Ben Affleck’s apartment, 1996. Out of nowhere, the script to 1997’s Academy-Award winning Good Will Hunting falls from the sky and lands right in front of Ben and his best bro Matt Damon. A test, a curse, or a pivotal point in both their careers? Whatever it is, it’s certainly better than Ben’s line-for-line adaptation of Catcher in The Rye. An explosion of pop culture references, Mindy Kaling and Brenda Withers’ Matt & Ben is a fun, totally absurd parody of Matt Damon and Ben Affleck’s famed ‘bromance’. Matt Damon (Kristen Padayas) and Ben Affleck (Carly McKee) are two struggling actors trying to make it big in Hollywood. Creative partners, the two friends meet in Ben’s greasy, run-down apartment to work on their screen adaptation of J.D. Salinger’s Catcher in The Rye. While Ben believes it’s their ticket to Hollywood, Matt is not so sure about the project and sneaks off to auditions behind his back. So begins the rift that emerges between the friends. Good Will Hunting’s sudden appearance makes clear the differences between Matt and Ben. Matt, a neurotic loser, has always hated the way Ben, a dumb popular guy, has coasted through life, not putting much effort in the things he does. In some way, Matt feels that Ben has held him back through the years. So, while he could stay with Ben and continue eating doritos and writing a terrible (plagiarized?) screenplay, Matt could also use Good Will Hunting to propel him to stardom, earning him the success he feels he deserves. The only issue is, where did the Oscar worthy original screenplay come from? And why does it have both their names written on it? (Damon and Affleck both co-wrote and starred in Good Will Hunting). These questions and more threaten to destroy the greatest bromance of the 1990s. Along the way, Kaling and Withers throw winks and nudges at both actors’ personal lives and filmography. Enough so that if one is coming in not well versed in their Damon/Affleck histories they might miss a good amount of the play’s jokes. Even so, audiences can still appreciate the bizarre circumstances that Kaling and Withers throw two of Hollywood’s top leading men into. Gwyneth Paltrow and J.D. Salinger make guest appearances, turning the weird factor up. And the Good Will Hunting script seemingly has a life of its own. Designer Julia Wasilewski has created a wonderfully detailed set for Matt & Ben. The refrigerator is stocked with take-out containers and expired food. Budweiser cans are scattered everywhere. The couch is ugly and possibly rotten. Ben Affleck’s headshot hangs neatly on the wall, along with a movie poster for 1992’s School Ties. Yes, it’s certainly the kind of place one would expect 1990s Ben Affleck and Matt Damon to live in. Padayas and McKee’s comedy chops elevate Kaling and Withers’ wicked funny script. Padayas’ nervous energy mixed with McKee’s boisterous portrayal of Ben Affleck have the audience in stitches, agasp for air. The madcap physical humour lights up the stage, but sometimes Valmai Goggin’s direction feels too relaxed. Padayas and McKee get lost in the play’s antics and bungle through some moments. While it passes just enough as part of the play’s quirky charm, one cannot help but feel that the direction could be tighter for Kaling and Withers’ zippy script. Of course, that is not to say that the script itself is not without issues. Although it starts strong, Kaling and Withers’ script does start to feel sloppy as it tries to reach a satisfying ending. Nostalgia and pop culture references carry the show, which runs at 80 min, only so far before the material dries up. 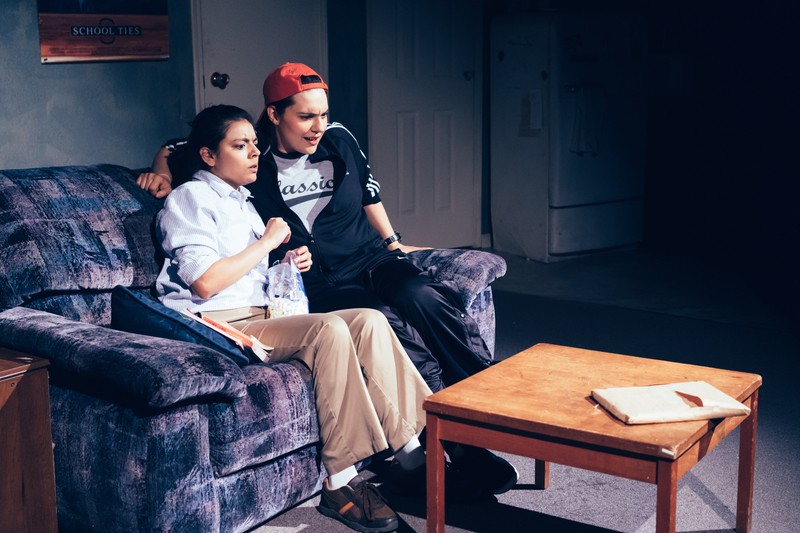 Presented by Theatre Transit, Mindy Kaling and Brenda Withers’ Matt & Ben is a hilarious play that has fun with its premise, making for a lively night at the theatre. Theatre Transit’s Matt & Ben runs May 28 – June 6 at Motel Theatre (Arts Commons).